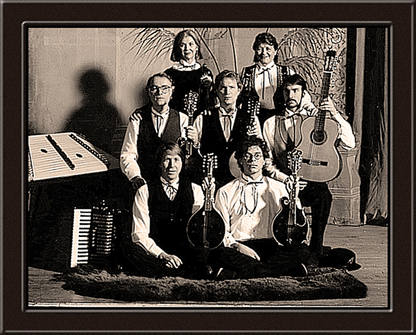 Founded in 1999, The Montana Mandolin Society is a non profit organization. It is one of two Nationally touring mandolin ensembles in America. In their nine-year history they have performed in concert across the country at International Festivals and Mandolin Conferences. Their four acclaimed CD's are currently getting international radio airplay. The Montana Mandolin Society's roots are in community performances, schools, workshops, and concerts across Montana. From its inception, their purpose has been to educate listeners about the flexible versatility of mandolins and mandolin music. A surprising chain of events brought forth The Montana Mandolin Society. Dennis White, director, came upon a rare photo taken in 1902. The photo showed the Bozeman Mandolin and Guitar Club made up of Bozeman's early founders - local businessmen, college students, cattle ranchers, and cowboys. The photo of the old time group led to the formation of the Society. www.kennedy-center.org in Washington D.C.. NPR www.npr.org featured the Society in an All Things Considered interview with Linda Wertheimer. In 2002 the Society released a second CD entitled THE BRIDGER WALTZlink, a collection that illustrates the profound inspiration we get from living in Montana. By invitation, They performed a two-week Japanese Musical Ambassador tour. Highlights of that tour were the 13th annual Kanto Mandolin Festival in Tokyo Japan, a concert at Roccoman hall in Kobe, and the Kumamoto Sister City Celebration in Kumamoto Japan. In September of 2004, the Society played for the HatcHfest Film Festival www.hatchfest.org "Spirit of Montana" Gary Cooper Award Ceremony where the award was presented to Peter Fonda by Jeff Bridges. In November 2004 The Society released MOSAIC.link The music in this third CD retains the flavor of an early nineteen hundreds classical ensemble while playing a new contemporary style of chamber music drawing from bluegrass, celtic, and jazz roots. NPR's Linda Wertheimer recognized this music as “The Montana Sound”, music worth applauding and saluting as a Montana original. Their music repertoire is highly eclectic and often written and arranged by musicians from The Society. The instrumentation includes the mandolin family; mandolin, mandola, and mandocello, as well as hammered dulcimer, cello, violin, bass, and percussion. In 2006, The Montana Mandolin Society released its 4th CD, DANCE OF THE SANDHILLlink which is a musical metaphor honoring the Sandhill Crane. The cover of this CD is a Limited Edition Print “DANCING CRANES” by Montana Artist Monte Dolack. This original artwork was commissioned by Maureen and Mike Mansfield in 1995 for the Symposium of Landscapes and Communities in Asia and the Pacific Northwest. Most recently the Society is featured in the January/February 09 edition of Montana Magazine www.montanamagazine.com authored by George Cole.